Lent 2 Archbold Evangelical Sunday: Nick Hudson and worship team, music, offertory. Message, “Patterns In Genesis-Joseph: Favor,” Genesis 37:2-11, Jesse Kahler. Central Mennonite Sunday: … Sorry! This content is only available to paid subscribers at this time. Please login below, or consider purchasing a subscription today! Fulton Co. Health Center March 11: Lindsay & Brian Baden, Archbold, girl. March 12: Rachael & Michael Drenning, Wauseon, girl. … Sorry! This content is only available to paid subscribers at this time. Please login below, or consider purchasing a subscription today! 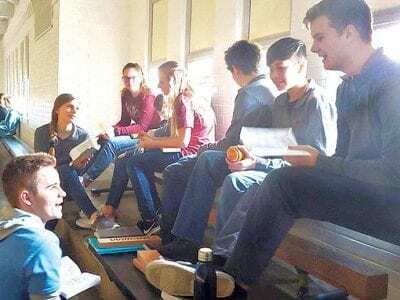 Quizzers from Central, Kings Cross, and North Clinton do some last minute studying during a break in quizzing, Sunday, March 17, at the 2019 triple-elimination 72- team Bible quiz tournament. C… Sorry! This content is only available to paid subscribers at this time. Please login below, or consider purchasing a subscription today! Agriculture Education Pettisville Adult Agriculture Education Night series, Monday, March 18, 7 p.m. Tour and talk at Archbold Wastewater Department, 515 Short Buehrer Rd., Archbold. Grief Helping O… Sorry! This content is only available to paid subscribers at this time. Please login below, or consider purchasing a subscription today! 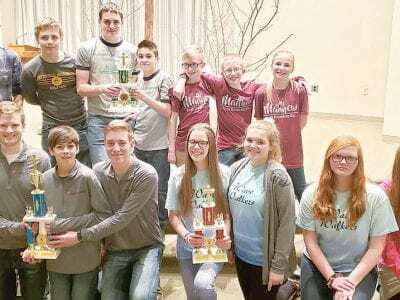 Front row, from left: ‘Huioi,’ a quiz team from King’s Cross, Defiance, is the 2019 area Bible quiz tournament champion with William Nofziger, Levi Baus, Elijah Delgado, and Brayden… Sorry! This content is only available to paid subscribers at this time. Please login below, or consider purchasing a subscription today! Lent 1 Archbold Evangelical Sunday: Nick Hudson and worship team, music, offertory. Candidates for membership: Joe & Bev Hancock, Jeryl & Jill Hostetler, Kraig & Shannon Keiser. Message,… Sorry! This content is only available to paid subscribers at this time. Please login below, or consider purchasing a subscription today! Fulton Co. Health Center Feb. 28: Char & Oliver Reeb, Ridgeville Corners, girl. March 2: Sara Young & Michael Growden, Swanton, girl. … Sorry! This content is only available to paid subscribers at this time. Please login below, or consider purchasing a subscription today! Transfiguration Sunday Archbold Evangelical Sunday: Nick Hudson and worship team, music, offertory; Gordon Schumacher, scripture. Baptism candidates: Kraig & Shannon Keiser, Carol Marshall. Mess… Sorry! This content is only available to paid subscribers at this time. Please login below, or consider purchasing a subscription today! Fulton Co. Health Center Feb. 22: Char & Oliver Reeb, Ridgeville Corners, girl. Feb. & Andrew Carnahan,Public26: Eva Wauseon,Meetingsgirl. … Sorry! This content is only available to paid subscribers at this time. Please login below, or consider purchasing a subscription today!